Today I want to share with you a look I’ve been loving for the past Summer hot days. I think it’s a quite smart look comparing it to other Summer looks. I feel comfortable wearing it to class or the library. 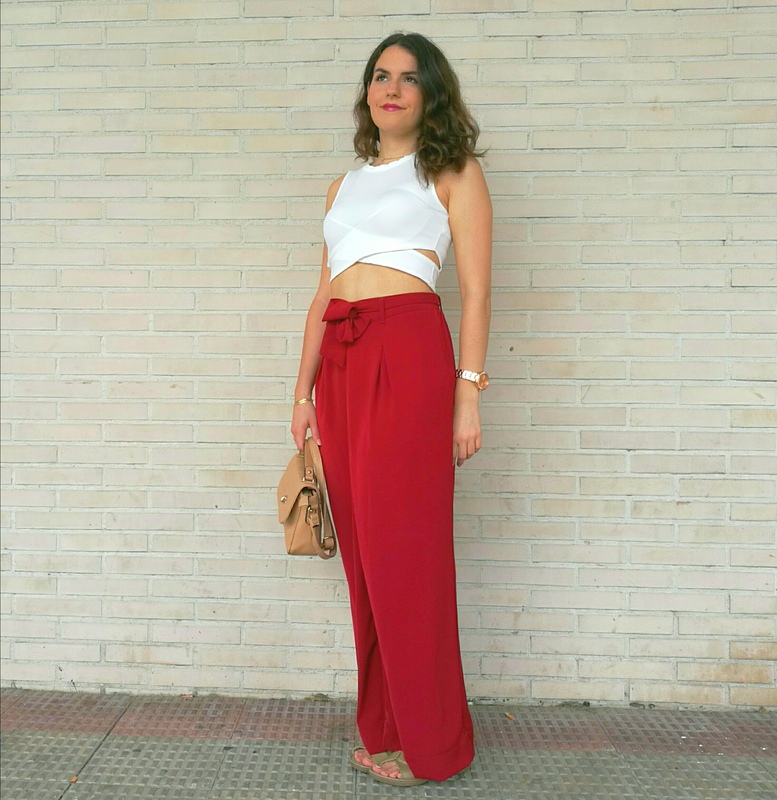 The main part of this look are this beautiful dark red palazzo pants. You might remember them from my last fashion haul. Palazzo pants are really trendy this year and I couldn’t be happier about it. I love them because they are high wasted, floaty and this particular ones have a cute ribbon as a belt. I love combining them with crop tops. In this case I choose this white crop top with small openings on the sides. 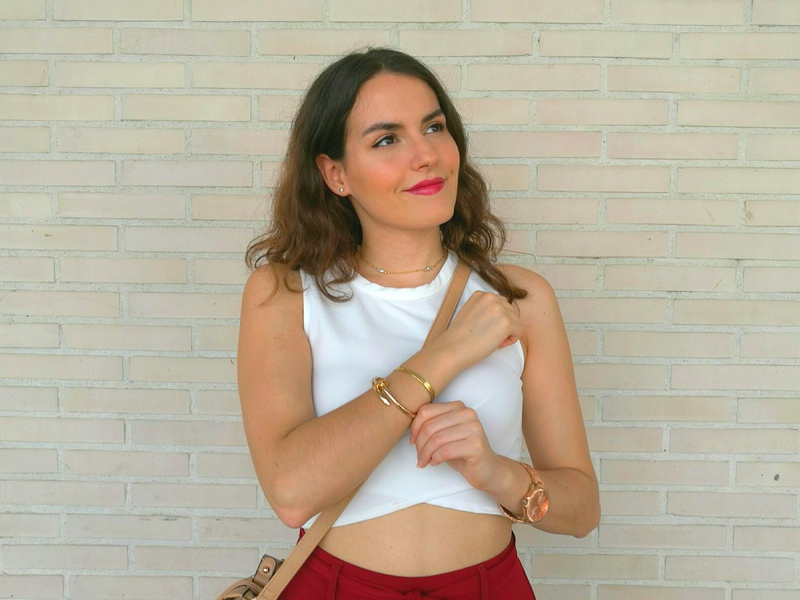 Both the trousers and the crop top are from Stradivarius. As accessories I wore some beige sandals and a cute beige small bag. Wearing a small bag helps me to not overpack it, sometimes my bag is full of unnecessary things and it’s really heavy. Lately I’ve been loving golden jewellery. For this look I wore a beautiful gold choker with pearls that was from my grandmother. Then I also wore two golden bracelets. I’m absolutely in love with the one in the shape of a nail. This bracelet has a similar style to the Cartier “juste un clou” bracelet. I also wore my rose gold watch. I think gold and rose gold mix quite well. Do you like palazzo pants? Do you prefer a larger or smaller bag? These look so chic and comfortable! i have to find some!!! If you mind would you check my blog and give me some tips? You can match the jewelry accessories with the dress you want to wear or alternatively create a contrast. absolutely love these pants! a trend i have yet to yet into, thanks for sharing! Oh I love pallazos! Regarding the bag, I always prefer a bigger one! Great pics and write up! Your outfit is cute. I appreciate your review of polazzo pants, since I’ve been skeptical. I’ve noticed them all summer and now fall at my favorite store. Where did you get your dark red palazzo pants? I absolutly adore them! I can’t seem to find them. Are they older or under a different name? you look great in those palazzo pants. Finally the era of the tight jeans is over. Would be great to see more posts like this or with classic Marlene pants.